No matter how long you are staying, this information about electronics will always come in handy. Did you know that the voltage system is different in Austria than in many other countries and that you will maybe need travel chargers? Do you want to buy something new? Or do you want to get something fixed? Read on! The rules regarding distribution of electricity for portable appliances and lightning differ severely among countries. Voltage, frequency, and plug type vary widely and physical compatibility of receptacles does not always ensure compatibility. In Austria, we make use of two types of plugs, identified as Type C and Type F in IEC World Plugs. The former is known as the “Europlug” and is described as a plug which fits into any socket that accepts 4.0–4.8 mm round contacts on 19 mm centres. The latter has 4.8 mm pins on 19 mm centres, but with grounding clips on both sides. We use a voltage of 230 V and a frequency of 50 Hz. 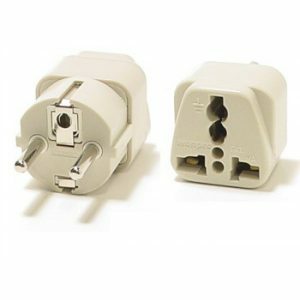 This standard has become widespread in most parts of the world, so in general you’ll be safe with the aid of an adapter or a change to the equipment’s connection plug for Austria. However, adapters that allow insertion of otherwise mechanically incompatible plugs into sockets may not ensure the same grounding and polarization as a compatible system of plugs and sockets. What does this mean for you? Careful: if your portable appliance is designed for another voltage and frequency combination, since it might not operate or even get destroyed (sometimes it even works for a couple of minutes or hours until it all of a sudden burns out!)! If you want to buy something new in Austria, definitely check out our description of warranty below, to know your rights. When you’re buying something, the question “where to buy” always pops up. You’ll want to pick the place with the best products, the best service and the best price. Two well known shops around Austria are Media Markt and Saturn. If you’re buying electronics in Austria or anywhere else in Europe, you are automatically (and without extra costs) entitled to a legal guarantee period of two years, even when you’re buying online. If an item has a defect or does not look/work as advertised, the supplier is obligated to repair or replace it free of charge, give you a full refund or a reduction in price. However, the legal guarantee only applies if the supplier’s performance of the contract is inadequate, meaning that you can only make use of this right in case the defect was already there when you purchased the product. Shops or producers often offer an additional commercial guarantee (or warranty) that can give you extra protection. This commercial guarantee can be either included in the product price or come with an extra cost. Note that the commercial guarantee never replaces or reduces your right on the legal guarantee! The only case in which the legal guarantee can be reduced is when you’re buying second-hand goods from private individuals on a non-professional basis. Then the guarantee can be shortened to one year, provided that this was negotiated with the customer.